A long time ago, the DELICIOUS SEEDS breeders took up the challenge and set to work in our growrooms. Their objective was to develop a plant with enormous yields without sacrificing any of the organoleptic qualities. This strain combines the sugary sweetness of Caramelo and the more delicate floral flavours of South African Sativas such as Power Plant. 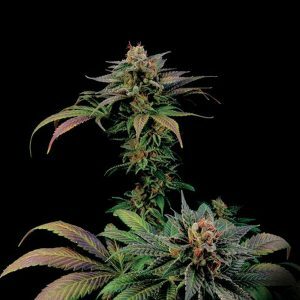 The result is a perfect Sativa type plant that is easy to control and which produces large, foxtail buds and whose leaves take on a metallic lavender hue towards the end of the flowering cycle. Branches out considerably, especially outdoors, where the lower branches can get almost as long as the plant’s height, which can triple in size during the flowering phase. Easy to trim owing to the small amount of leaves between the buds. Gives off a very strong citrussy aroma like grapefruit or lime. Very sweet taste with hints of skunk and cedarwood making it even more earthy and citrussy. The very euphoric effect, which is cerebral and almost impercetible in the body, is almost instantaneous and longlasting. A strain with very high levels of THC, some growers have found it difficult to sleep when they smoke our Cotton Candy.